When I began using social media, I quickly realized that being an active participant was going to take time. 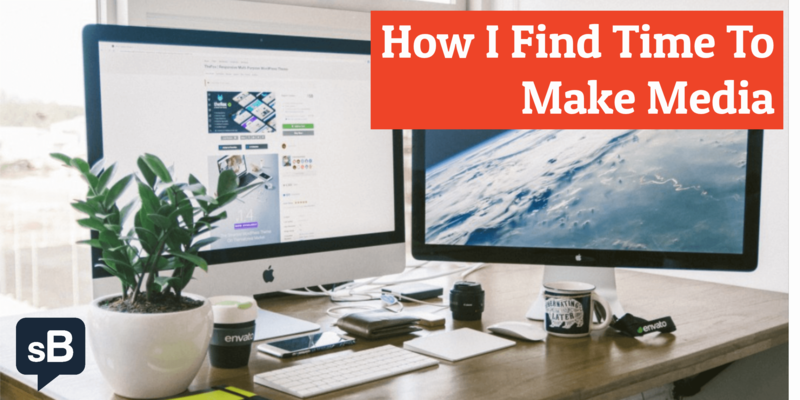 With a full-time job, a growing young family, and other pressures on my time, I knew that I was going to have to be uber-organized to be successful with my blog, Twitter, Facebook, LinkedIn, Pinterest, and Google+. The key to my ability to make media directly stems from being organized which includes my social media system. An added benefit of being organized is that it helps clear my mind – which in term helps me be more creative. I adopted this system, and have been successful using it for over two years now, because of two reasons: 1. the GTD method is easy to understand, implement, and maintain; and 2. I’ve found electronic tools that have allowed me to implement the GTD method in conjunction with my electronic life. Simply put, the GTD method serves as the basis for allowing me to carve out time to make media. This is a chicken or the egg causality dilemma for me: as I create more media, my media consumption has changed, or my media consumption has changed; hence I’m able to create more media. I don’t know which came first but what I can tell you is that I watch much less TV, read more than I ever have in my life, and listen to industry-specific podcasts. I rarely watch TV anymore and when I do it is usually a sporting event, a movie, or Anthony Bourdain’s No Reservations. I just don’t find sitting mindlessly in front of the TV exciting anymore. Rather than watch TV, I take time with my family or read. Speaking of reading, I read all the time. Whether it’s a book, a blog, or the newspaper, not only do I find enjoyment in reading – I also find blog topics and ideas. Finally, I have become a fan of podcasts. In my never-ending quest to find time to exercise, which I still don’t often do enough anymore, I’ve started to walk and listen to podcasts at the same time. I feel like I’m killing two birds with one stone. There are many great podcasts out there, but I would recommend starting with the Rainmaker.FM podcast network which is actually made up of a number of different shows. How many social media channels do you feel you can manage and participate in fully? What are you’re goals for each channel? What will be your publishing schedule for each channel? What information will you share on each channel? What audience is each channel geared toward? Will there be any overlap with your social media channels? Can you re-imagine content between channels? My advice, when determining your own SMS, is to start small to keep things manageable and enjoyable. I will write soon outlining the details of my own SMS. By utilizing the GTD method, changing my media consumption, and creating my own social media system, I’ve been able to schedule time, generate ideas, and work background from my goals, to create more than media than I ever have in my life – and I feel like I’m just getting started. I would love to hear your questions about my ideas or things that you have implemented in your own life that has allowed you to make media. Good post, Brendan. If you follow up on this post, you might also want to mention Hootsuite or Tweetdeck in order to manage all your social media together in one place. I have included your post in ‘Best of the Web’ http://j3webmarketing.com/best-web so others can also benefit by it. Please take a look and share with your friends and colleagues. Thanks. I, too, look forward to connecting soon and thank you for your work and inspiration! Whatever system enables you to produce the quantity of quality that you do produce is the gold standard, Brendan. You are an inspiration. I look forward to meeting you some day, but in the meantime, I am in awe of your work. @sells_annie sells_annie Thanks so much for taking the time to comment and I’m really glad that you enjoyed the post. I look forward to reading your blog in the VERY near future! @Fort Collins Business Coach Thanks so much for taking the time to comment and I’m so glad that you found my SMS useful. Did you lift this from my blog? I joke of course, but I couldn’t agree with your more. I have addressed several of these topics myself and always discuss them with clients. There are always multiple ways to accomplish what we set out to do, but with organization and a clear and active (non-TV) mind, determination and a game plan we are far more likely to accomplish what we set out to and to do it in record time. Keep the great content coming. Brendan, thanks for this article. I stumbled upon it looking for something else, but so glad i found it. As a coach i tend to do a lot of training on social media. Your SMS better defines what I walk my clients through. In order to be successful you do not need to do everything. Define what you can do. Define why you should do it. Set some goals that are measurable. Execute. I really like your SMS. It will help many of my coaching clients. Thanks for your comment Ann! I’m really glad you found the post helpful. I sooooo needed to find this article today. a SAHM of 2 prechoolers and a budding marketing consultancy too, there aren’t enough hours in the day!Thank you for hitting home. I’m tired of doing too much only halfway. Time to go big…on a schedule! I would agree with you from the standpoint that I define media as photos and video – which I am trying to do with more frequency. Overall though, I find myself writing more and more. Thanks for reading and for commenting. I really do appreciate it! I’m pretty sure you make content, not media. If you’re making new forms of media, I am very impressed. Thanks Todd! I’m glad you enjoyed the post. Nice post, Brendan — I curated some of your thoughts here: http://e1evation.com/2011/05/15/how-i-find-time-to-make-media/. You might be interested in my post on how I developed a ‘lather, rinse, repeat’ cycle called the ‘e1evation workflow’ using Google Reader, WordPress and social media outposts to build a social media system. You can find that post here: http://e1evation.com/2011/02/16/consume-create-communicate/. I like the way you think — I’ll be tracking you! :-). Thank you so much for taking the time to comment…I’m flattered. It’s really nice to hear that people are actually reading what I write and find value in it.